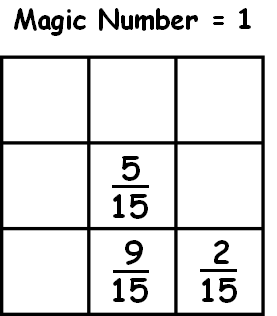 Engage Students With Fun Fraction Magic Squares. Discover Adding Fractions in a Fun and Engaging Way! You're probably already familiar with magic squares. But you may not have played around with fraction magic squares. They'e great for getting a class engaged with fractions! Students should understand that the sum of each row, column, and diagonal, are all the same, and that sum is the Magic Number! The fraction magic square to the left is partially filled in. Notice two of the fractions are not reduced. Depending on the level of your student, you could have them work on magic square with like denominators, as the on on the left. 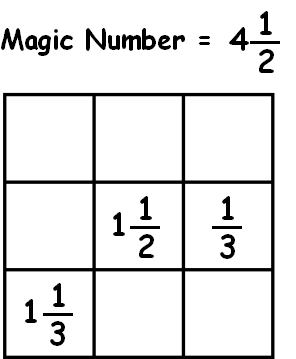 This fraction magic square is the same as the one above, but notice the fractions are reduced. 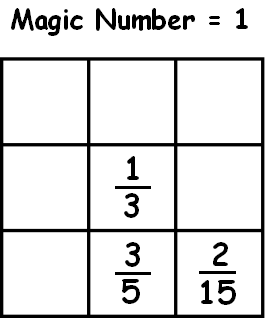 Depending on the level of your student, you could have them work on magic square with unlike denominators, as the on on the left. So depending on what level your student is at, choose one of the magic squares above that is works for them. Below is another magic square that will give students practice with mixed numbers. As you can see this fraction magic square has mixed numbers and fractions with different denominators. Students will get to practice adding both mixed numbers and fractions with unlike denominators. given the list of nine numbers.